While watching the regular updates on Malala Yousafzai, the teenage girl who was shot by the Taliban and flown to the Queen Elizabeth Hospital in Birmingham for life-saving treatment, we noticed something peculiar about the hospital’s Medical Director, Dr. David Rosser. He wears only Welsh ties! Welsh rugby ties with the Prince of Wales’ feathers, ties with enormous red dragons… Is he trying to tell us something? The Welsh flag consists of a large, red dragon on a background of green and white. Not only is Dr. Rosser Welsh, he is also extremely proud of it. How does the rest of the nation celebrate their Welshness? Well, let’s begin with Saint David, our patron saint, whom we celebrate on the first of March each year. St. David’s Day has been celebrated through the ages and was finally declared a national day of celebration in the eighteenth century – it is one of the most important days in the Welsh calendar. It is yet to become a public holiday, however, in spite of 87% of the Welsh public voting in favour of it in a poll in 2006. The National Assembly of Wales voted unanimously to make St. David’s Day a holiday but the request was turned down by Tony Blair’s government in 2007. We are still waiting! Who was St. David, and how did he become so important to the Welsh? “Dewi Sant”, as he is known in Welsh, was a Celtic monk, abbot and bishop who lived in the sixth century. During his life, he was the archbishop of Wales, and he was also one of the early saints who help to spread Christianity among the pagan Celtic tribes of western Britain. From fairly reliable sources, we learn that Dewi was a gentle person who lived a frugal life. He was also said to be of royal lineage – his father, Sant, was the son of Ceredig, who was prince of Ceredigion, a region in South-West Wales. His mother, Non, was the daughter of a local chieftain. Dewi was born near Capel Non near the present city of St. David (the smallest city in Britain). He was educated in a monastery called Hen Fynyw, and his teacher was Paulinus, a blind monk. A few years later, he travelled far on his missionary journey through Wales, where he established several churches. Dewi is sometimes known in Welsh as “Dewi Ddyfrwr” – David the Water Drinker. Indeed, water was an important part of his life since they say that he drank nothing else. There are many stories regarding his life but perhaps the most famous is said to have taken place at Llanddewi Brefi. The people were to decide whether Dewi was to be archbishop – a great crowd gathered and when Dewi stood up to speak, many complained that they were unable to see him. At that instant, the ground rose till everyone could see and hear Dewi. Shortly afterwards, he became Archbishop. It is claimed that he lived for more than a hundred years; it is generally accepted that he died in 589. Dewi was buried in the grounds of his own monastery, where the Cathedral of St. David now stands. 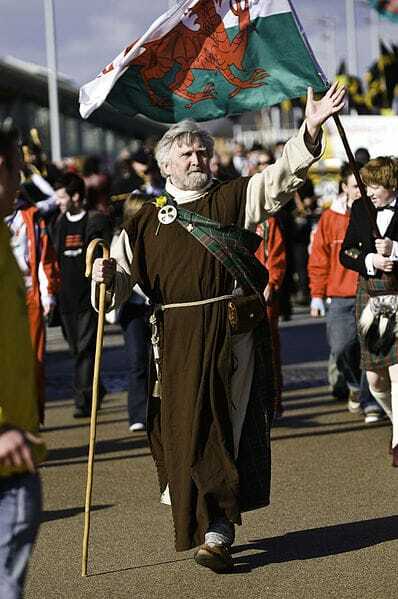 After his death, his influence spread far and wide and St. David’s Day, as celebrated today, dates back to 1120 when Dewi was canonised by Pope Callactus the Second, and March 1st was included in the Church calendar. After Dewi’s canonisation, many pilgrimages were made to St. David’s, and it was reported that two pilgrimages there equalled one to Rome and three pilgrimages to Jerusalem. Children, particularly primary and infant school children, are dressed in Welsh costumes to celebrate the day. For girls, this consists of a long woollen skirt, a shawl, a white blouse and a tall black hat with ribbons or lace; for boys, a white shirt and woollen waistcoat with short woollen trousers and a black beret-style cap. Many children participate in their school Eisteddfod, a Welsh concert consisting of song, dance, recitation and competition. St. David’s Day is a time to recognise and celebrate Welsh identity. Societies all over “Walescelebrate” have special meetings and concerts. In St. David’s Hall in Cardiff, there is usually a special concert with a male voice choir, specially formed for this occasion. The saint has also become synonymous with keeping the Welsh language alive and preserving all that is good in the Welsh way of life. St. David himself spoke an old form of Welsh, which is one of the oldest living European languages, and although it has been oppressed for centuries, this language is still alive and has been growing recently.